Fire and Ice is a new restaurant in Birmingham, Ala., and some friends and I checked it out a couple nights ago. It’s in Five Points in the building where a Gap was several years ago — and it sure doesn’t look like the place where we used to buy blue jeans. 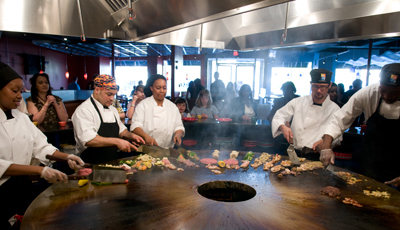 Fire and Ice is a sort of do-it-yourself stir fry/grill restaurant. You don’t cook it yourself, but you create your own bowl of ingredients from a well-stocked buffet and then take it to a huge round grill where cooks sizzle your creation to perfection. That’s the “Fire” part. 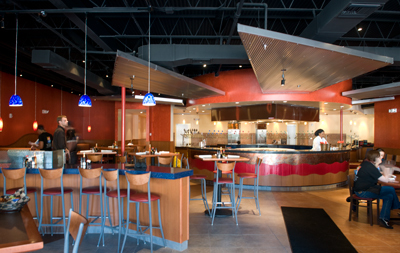 The “Ice” part is the bar, which is decorated in cool shades of blue to contrast with the red decor of the food part. Here’s how it works: When the waitress seats you, you get a complimentary bowl of chips and salsa and you order drinks while she explains the process and even takes you on a tour. The buffet has a salad bar with the usual items and then a section with ingredients for your entree, although you can mix and match. The entree bar has a wider variety of vegetables such as bok choy and sweet potatoes — some cooked and some not cooked — along with uncooked meats such as scallops, salmon, shrimp, BBQ chicken and tenderloin plus tofu. You can do your salad first and then go back for your entree, which you build in a bowl as high as you wish. Of course, we five experienced moms sort of cringed at the thought of adding raw meat to a pile of vegetables and letting it set for a few minutes, but our waitress assured us it would be OK, and of course it was. The really fun part, though, is figuring our your sauce. There are about 1o or 12 to choose from, with flavors such as Cajun, Asian and Southwestern. I really liked the Roasted Garlic with Honey and then a pineapple-ginger one. You can stick with one or mix some together. So you put your sauce in little cups and take your bowl of ingredients plus your sauce over to the grill, where the cooks deftly arrange your ingredients in a line, do their magic, add your sauce and in a few minutes you’ve got a hot and yummy personalized stir fry. You can take your drinks to the grill while you watch and go back as often as you like. It was lots of fun, but it can be a little intimidating if you feel pressured by the thought that a good meal is up to your own skill at combining ingredients. After all, relying on somebody else’s expertise is one of the reasons we go out to eat. But there are no bad choices, and the sauce redeems all. If you’re uneasy at first, start out small with only a few ingredients — although if it’s crowded and there’s a line at the grill, this approach might slow down your evening. And if you don’t want a stir fry at all, do a hamburger or veggie burger at the grill and get a big basket of fries to go with. Yum! The salad/entree bar is $15.95 for dinner and $9.9 for lunch. There are also appetizers and a dessert, including a fondue for more do-it-yourself eating, but these are extra. As long as you’ve got folks along who are willing to try something new, this is a great place. It’s also good for families like mine, where everybody likes different things. According to the Web site, http://www.fire-ice.com/, Fire and Ice is a chain that started in 1997 in Cambridge, Mass., and now is all over the world. It’s fun and different, so try it. This entry was posted in Alabama, food, friends, Uncategorized and tagged Alabama, Birmingham, cooking, food, friends, restaurants, reviews by Coffee with Cathy. Bookmark the permalink. Yes it was tons of fun to try this new dining experience! Your description Cathy would make me want to go there if I hadn’t already. Sounds like I really missed out. Hmpf. Well, one of the best parts was going there with my dear friends — and, of course, it would be even better going there with my dear husband. Thanks, everybody, for the kind words. I’ve got lots more to post about our Birmingham adventures, as you can imagine, so stay tuned!